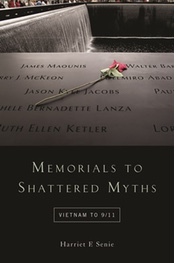 Harriet F. Senie, author of Memorials to Shattered Myths: Vietnam to 9/11, is Director of the M.A. Program in Art History and Art Museum Studies at City College, City University of New York, and also teaches at the CUNY Graduate Center. She is the author of several books and numerous articles on public art, and is co-founder of the international organization Public Art Dialogue and co-editor of its journal, Public Art Dialogue. For more information please visit http://www.harrietfsenie.com. Since Columbine (and after each school and other mass shooting) the sales of guns go up. At the same time there are widespread calls for gun control but none have taken hold. Just last year Patrick Neville, a sophomore at Columbine at the time of the shootings and now a Colorado state representative, introduced legislation that would make it legal for "any law-abiding citizen" (presumably mental illness notwithstanding) to carry concealed weapons in public schools. Similar legislation has been proposed in other states, and is now in effect in some. From the start, memorialization of the Columbine shootings tried to obliterate the memory of the Eric Harris and Dylan Klebold. In the immediate aftermath fifteen crosses were erected across the street from the high school. The father of one of the boys who was killed destroyed the crosses dedicated to Eric and Dylan. The library, the site of most of the killings, was eradicated and rebuilt on the other side of the high school and replaced by a two-story glass atrium with a landscape mural of trees and sky. The permanent memorial focused exclusively on the victims and their families. It was intended to "honor the deceased, the injured, the survivors and community members." Dedicated on September 21, 2007, some 8 and a half years after the shootings, the key elements were an inner "Ring of Remembrance" and outer "Ring of Healing." The inner ring is divided into three sections, each waist-high stone wall topped by panels engraved with the names of the dead and a personal reflection provided by their families. The overriding theme is religious; eight statements invoke God. The outer ring, a brick wall built into the side of a hill, features plaques with quotes by students, parents, first responders, and some of those who spoke at the groundbreaking. Nowhere is the tragedy defined, the crime mentioned, or the killers named. Thus, the memorial obviates the possibility to think about the important things Sue Klebold raises in her memoir: what caused the two boys to go on their rampage; what actions might have prevented it; how to address the widespread issue of undiagnosed teenage depression; and the link between murder and suicide. Sue Klebold's goal is "to educate people," while the memorial's was to focus solely on the victims of the tragedy, thereby creating an endless loop of mourning, reinforced viscerally by the circular form that it took. Hopefully Klebold's brave memoir will prompt a different, far reaching conversation and encourage us to think about the issues raised by Columbine. Wouldn't we honor the dead (and their families) more by building memorials that also provide a safe place to consider the causes and implications of the events that cost them their lives?